My dad is...enthusiastic about oatmeal. We fought him for years; we wanted a donut from the place down the street. Not...oatmeal. Gross. Well, not anymore. Now that I'm an adult, I get to choose what goes in my oatmeal. So let's forget the nutritional value, fiber and whole oats that we'll be putting into our bodies. Let's have some fun, shall we? Boil the oats and milk. Reduce heat and simmer, stirring occasionally, for around 10 minutes. 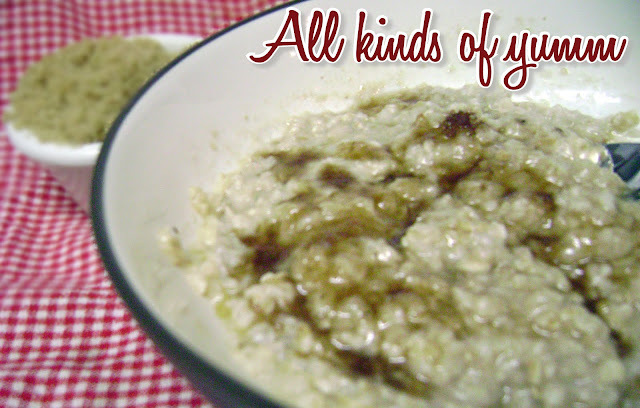 The consistency of your oatmeal is completely up to you. You can add more or less depending on how thick you want it. I would add small amounts of milk at a time until it's the consistency that you prefer. This is just how much milk I like. Remove from heat and set aside. Allow it to thicken a little while. Add maple syrup, brown sugar and honey. Stir gently over low heat. Top with raisins or other dried fruit. Don't freak out when you read this, but...butter pecan ice cream. Just sayin'. Believe it! Add some cocoa mix, stir well, and top with chocolate chips. Even the healthiest of breakfasts can turn into a monstrosity. Was I thorough enough? So you tell me — what's your favorite oatmeal topping? Hi Rachael - I'm a recent fan of oatmeal. Favorite topping: non-fat Greek yogurt, walnuts, raw sunflower seeds, drizzle olive oil, pinch of sea salt. Hope you all had a marvelous 4th! Maple Brown Sugar is def my fav!